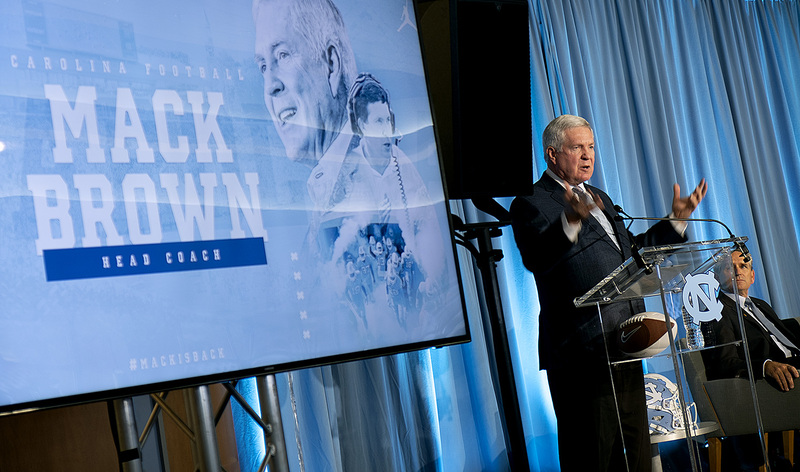 Since leaving Chapel Hill in 1997, Mack Brown has won a national championship and national coach of the year honors, and this year he will enter the College Football Hall of Fame. He also departed a 16-year tenure at the University of Texas with a 30-21 record in his last four seasons, and he announced his resignation amid growling from Texas fans who are used to winning at a much higher rate. 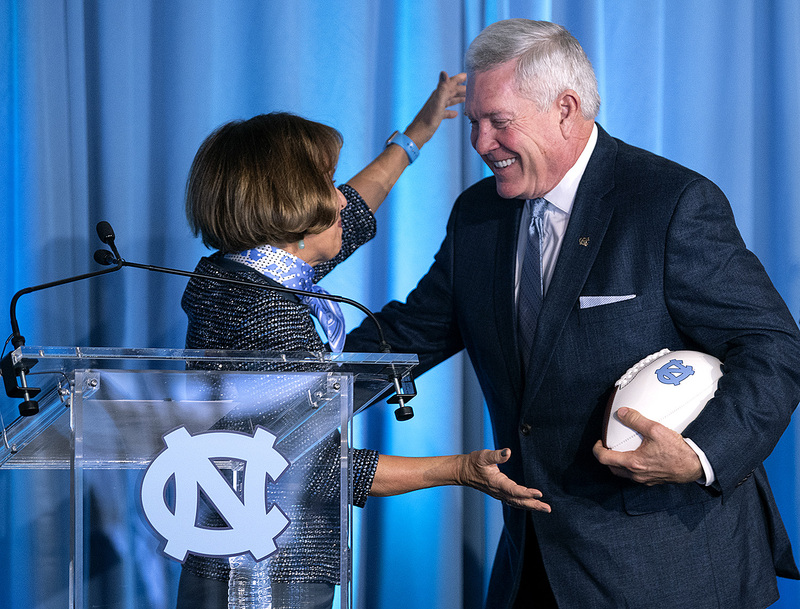 Brown, 67, was re-introduced as the head coach of the Tar Heels at noon on Tuesday. He was enticed back to town following the firing of Larry Fedora on Sunday. Brown is widely credited with putting Carolina on the national football map — if briefly — in the last six of his 10 seasons at UNC. He has not coached since 2013, spending the past five years as a football analyst for ESPN. On Tuesday, he acknowledged a reporter’s suggestion that he “felt the need to go help” Carolina. 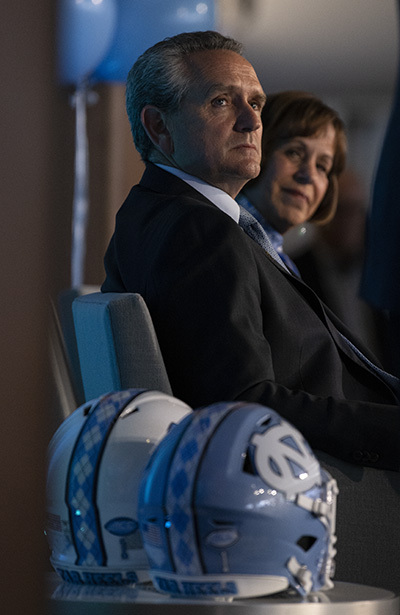 He said that after thinking about re-entering coaching every year and having some interviews, he and his wife decided UNC was the only place they would do this again. Brown will be paid a base salary of $750,000 per year, but his total annual package, including money from Nike and the media company Learfield and “supplemental compensation,” comes to just shy of $4 million. He finally will get to move into the office he saw built but did not stay long enough to occupy. Besides a respectable 69-46-1 game record, that despite 1-10 records in the first two years, Brown left UNC as it was putting the finishing touches on a grandstand enclosure in the west end zone and a first-class players’ facility and football museum behind it. He is credited with a major role in the private fundraising for the building. The Tar Heels finished that year ranked sixth nationally. Coaches often are measured by their success against their most serious rivals, and Brown was very, very good in North Carolina. After the initial losing seasons, his teams lost only three times in 24 games against N.C. State, Duke and Wake Forest over eight years. He was bound for more accolades at one of college football’s premier addresses. Brown won 158 games and lost 48 at Texas. The national title came in an undefeated 2005 season. The Longhorns also played in the title game in 2009. Prior to his time in Chapel Hill, Brown was head coach at Appalachian State and Tulane. His overall record as a head coach is 244-122-1, making him the 10th-biggest winner all-time in the game’s top division. He won more games than any college coach in the country over a 24-year period from 1990 to 2013. His only losing record at Texas, and only failure to make a bowl game, came in 2010. Brown’s annual salary was about $5 million in his last season at Texas. He said he has not talked with anybody about joining his staff. He was scheduled to meet with his players Tuesday afternoon and said he also was being mentored by some of the members of his first teams at Carolina. Brown handed gratitude to John Swofford ’71, the athletics director who hired him here and now is commissioner of the ACC. UNC reported that 80 percent of his players at UNC earned their degrees; that at Texas, more than a third of his players earned 3.0 grade point averages and were named to the Big 12 honor rolls; and that from 2006 to 2013, Texas placed a league-high 159 players on the Academic All-Big 12 team, 35 more than any other school. UNC has not had a head coach leave of his own volition since Brown. The University has in that time released Carl Torbush, John Bunting ’72 and Butch Davis. Four of Fedora’s seven teams had winning records, but after consecutive years of three and two wins, his record at Carolina was 45-43 overall and 28-28 against Atlantic Coast Conference opponents. He was let go Nov. 25, the day after an overtime loss to N.C. State.